The 2018 Snowbird Nationals proved to be a big success for Awesomatix USA. The largest of any team there, Awesomatix was well represented in all TC classes. 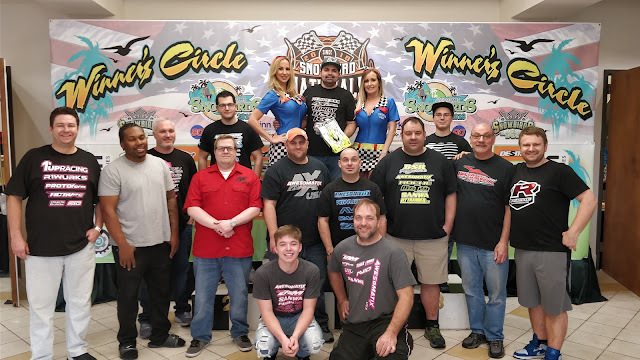 Several drivers had their debut with the Awesomatix platform at the Snowbirds, including Cory Parson and Eric Anderson, with great results to show for it. In USGT, it was TQ holder Billy Sydor who would win from the tone. Bill would be pressured for the first 1/2 of the race as a 4 car freight train with Art Scrimo (Awesomatix), Andrew Mowery and Chris Vogan all looked in contention for the win. By the mid way point after a few taps and check ups, it was Bill Sydor in cruise control maintaining a 4 second lead until the finish. Chris Vogan would finish second, with three Awesomatix cars of Art Scrimo, Mike Molina and Brian Busse rounding out the top 5. Arvin Nano would come home 8th and JD Ramsey 10th both in an Awesomatix. In 21.5 TC, it was TQ holder Cory Parsons who would win from the tone, having a Sunday drive as the field would pile up behind him. Cory went on to win by almost a three second margin in front of Art Scrimo’s Awesomatix A800XA. The end result was an Awesomatix 1-2-3-4 finish with a total of 7 cars in the A main final! Monti Panzica would finish 3rd, Brian Card 4th, Furman Walker 6th, Arvin Nano 9th , and Bill Sydor 10th, rounding out the A main grid. The 17.5 TC class was stacked with several top drivers and multiple national champions. At the end of 4 rounds of rocket round qualifying, Sam Isaacs would hold the TQ spot with Ray Darroch and Matt Lyons, both Awesomatix, holding down the 2nd and 3rd spot respectively. New Awesomatix convert Eric Anderson would qualify 5th , with a car that was capable for a higher position. Cory Parsons would go 7th on his first weekend with the Awesomatix A800XA, and Bill Sydor would qualify 8th. Mike Hanulec was awarded the BQ-screw, and won the B main tone-to- tone to bump up into the A final. The 17.5 main proved to be more eventful than qualifying. At the tone, Sam would lead the field around for the first lap before tapping the sweeper and getting pushed into the outside board. He would recover to take back over third, with Matt Lyons now in the lead followed closely by Drew Ellis. Drew would try to make a clean pass on Matt, but a few laps later got into the side of him, putting Sam back to the lead, followed by Eric Anderson and Robbie Dodge now in 3rd . Eric would try to make a run on Sam, but Sam was able to maintain his position for the rest of the race to take the victory! Eric Anderson had a great run from 5th on the grid to end second, making it an Awesomatix 1-2 finish! Matt Lyons would do his best to recover from an early race incident to finish 4th overall. 17.5 was also an excellent showing for Awesomatix, with 7 cars in the main! Modified TC proved to be the most competitive class, with several drivers making their way over from Asia for the race. In early practice, Team Associated’s Keven Hebert would set the pace, with several drivers closely behind him, including Yugo Nagashima, Jin Sawada, Sam Isaacs and Matt Lyons. Qualifying was to begin and the playing field looked very even going into round 1. The Japanese driver Yugo Nagashima was able figure out the high traction of the CRC black carpet to ultimately take the pole position over Sam Isaacs, just 1.3 seconds back after 4 rounds. Third on the grid would be AE’s Keven Hebert followed by the Destiny of Jin Sawada. Awesomatix would have a total of 3 cars in the main final, more than any other brand, with Sam 2nd , Matt Lyons 7th, and Donny Lia in 9th starting position. The mod TC main proved rather uneventful, with Yugo taking a 1.3 second win over Sam in first and Keven in third. Sam would work to keep Yugo honest, who made a few small taps during the race, but ultimately fell a little short of catching him. Keven and Sam would have a good race, with the two drivers finishing just half a second apart. Matt Lyons would end up in 7th with Donny Lia in 8th at the end of it all. We'd like to congratulate Michael Kamali on his TQ + Win with is Awesomatix A800. After an amazing week of competition it was truly great to see how well both our team drivers and customers had done with the Awesomatix platform. We just love the Snowbird Nationals as it is such a unique event featuring nearly 24 hours of racing in road and oval. Full results and pictures below!